Zenolite is an optical grade polymer panel that is co-extruded to encapsulate both a colour and clear layer. Zenolite is not painted andutilizesthe same technology required to produce LCD displays, giving it crystal clear colour and depth. Zenolite's fused colour layer ensures nothing can get between the co-extrusion meaning a long lasting, fantastic finish. Zenolite has 20 times the impact strength of glass, yet is only half the weight. This makes Zenolite economical to ship, store and handle during installation. Zenolite can also be cut, drilled and fabricated on-site with standard wood working tools, ensuring a high quality finish and reduced productlead-times. Zenolite is inert and non-porous therefore it is extremely hygienic and will not harbor mould, bacteria, soap or calcium build up. Zenolite does not need grouting, so there is no potential for mould build up on the surface, as is common with tiled surfaces. Zenolite® has a comprehensive range of colours, sheet sizes and limited edition options for you to choose from. Whether you're using Zenolite to install ahotel or office foyer,large commercial application, kitchen splash-back, shower wall or any number of other installation options, Zenolite has a solution that is both flexible and incredibly cost effective. The award winning Zenolite product is unlike any other acrylic or glass product on the market having the added bonus of being able to be bent, and is many times stronger than glass making it the product of choice for architects from all corners of the globe. With amazing applications which push the boundaries of what was thought conventionally possible, Zenolite is the first choice for residential and commercial building applications. 1. Zenolite 2 MM – In residential or semi-commercial applications. It is very good for Furniture, wardrorbes, kitchen shutters, backsplash etc. Since this product is in 2 MM hence it has good flexibility as regards to shaping, thermoforming and etc. Very versatile product with light wt and flexibility as compared to glass and the strength is 10 times that of glass. 5. Lustrolite – 4 MM with Hard coat and can be used in the toughest of environments. stands for a high pressure laminate (HPL) with surface of pure copper. The metal sheet is applied to a core of phenolic resin using high pressure. All our products are coated with an UV–lacquer based on acryl. The lacquer has scratch hardness in EN 438 of1, 5 N.
The surface is unaffected by common household agents /solvents. Alcohol has no effect. Slight variations of the silky shine/gloss coming from raw copper material are unavoidable. A slight unevenness in the surface of the laminates is one of the features of this product. The slight indentations are at the present stand of the technique and are unavoidable and normal. The same holds for the colours. Slight colour variations may occur during the production process and are not detrimental to the overall appearance. The pure metal surface is suitable in connection with rustic surface structures for individual internal decorative fittings. These are enhanced by the possibility of a brown toning. The various products available are characterized by stark surface structures. Zenolite sheet is suitable for many vertical surface applications around the home, office or commercial environments. Typical uses include hotel foyers, commercial premises, public spaces, kitchens, bathrooms, laundries, partitions and vast array of interior features. Zenolite can be applied to flat or curved surfaces. Zenolite can be used behind electric and induction cooktops with an allowance of 50mm between the rear edge of the cooktop and the face of the Zenolite panel. Zenolite is not suitable for use behind or adjacent to gas cooktops. For shower and bathroom applications we recommend Zenolite HC which features a third hard coated layer which is highly resistant to scratching, harsh cleaning chemicals, soap and calcium build up. For more information on the installation of gas cooktops, refer to local standards or contact the appliance manufacturer. 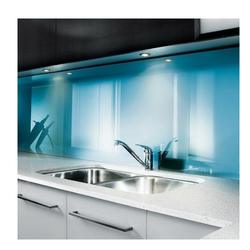 6mm (0.24”) - Wall cladding large areas, splashbacks, shop fitting, feature panels and signage. 4mm (0.16”) - Glazing infills, furniture and signage. Wall cladding residential. 2mm (0.08”) - Lamination, joinery and furniture. t's the perfect material to create stunning bath and shower walls, and kitchen backsplashes. Zenolite is a replacement to tiles and looks like back painted glass. With a special hard coated top layer for extra scratch and chemical resistance, cleaning and maintaining your panels is nearly effortless.